Are 401(k)s With Vesting a Bad Deal? Question: My employer's 401(k) has "cliff vesting." That's a bad deal if I leave, right? Should I just invest in an IRA instead? Answer: 401(k) investors tend to dislike vesting schedules. But they might not be as much of a deal breaker as you think. The idea behind vesting is to encourage employees to stick around. Vesting schedules can be structured in different ways--or your company may not have one at all--but 401(k)s have to vest at least as fast as a two- to six-year graded schedule or a three-year cliff schedule. That means that under each of these worst-case scenarios, if you leave your employer before two years have passed, you will leave with 0% vested. 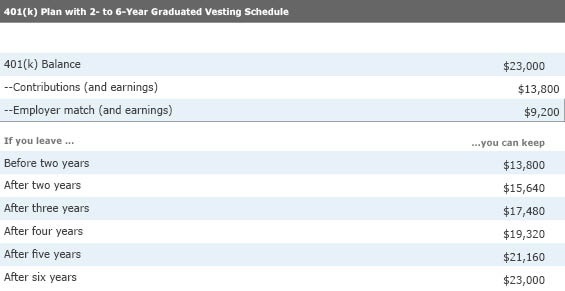 In a plan with a graded vesting schedule, the vested balance increases in 20% increments each year beginning in year 2. Employees in plans with three-year cliff vesting will be 0% vested until three years have passed, at which point they are 100% vested. One thing that's important to note, however, is that vesting doesn't really penalize you for leaving, it rewards you for staying. In other words, YOU WON'T LOSE ANY OF THE MONEY YOU CONTRIBUTED, nor will you lose any of the interest that your money earned. The money that's on the line is the employer match. The longer you decide to stay with your employer, the more employer match money you get to keep unconditionally. If you leave before the vesting schedule is up, you are arguably no worse off than if you had invested in an IRA. If your employer offers a match, invest at least up to the match amount. Even if you think it's unlikely you'll stay with your employer for the full vesting period, there's a chance that you could. And if you do, you could increase your 401(k) balance by a considerable amount--in the example above, by more than 60%. Some 401(k) plans restrict enrollment to employees who have completed one year of service or 1,000 hours, or to employees who are age 21 or older. If you're not eligible to participate in your company's 401(k) but you're eager to start saving, consider contributing to an IRA. Anyone with earned income can contribute to an IRA. Traditional IRAs and Roth IRAs both offer tax-free growth of money. The contribution for both account types for 2019 is $6,000, or $7,000 if over age 50. The biggest difference between the account types comes down to when you pay taxes on the money. If you are not eligible to participate in your employer-sponsored retirement plan, you are eligible to deduct your full contribution from your taxable income. (If you're married filing jointly and your spouse is covered by a retirement plan but you are not, the deduction starts to phase out at income levels above $189,000 and is completely phased out if your income is above $199,000. The income is ultimately taxed when it is withdrawn in retirement (similar to how 401(k)s are taxed). Be aware that if you withdraw the money before you turn 59½, you may be subject to a 10% penalty on the withdrawal. You can't deduct Roth IRA contributions from your taxable income. But when you withdraw the money in retirement, it's tax-free. You may not be eligible to contribute if your income is above certain thresholds. Single filers and head of household can make a full contribution if your income is below $122,000 and a partial contribution up to $137,000. For married filing jointly, you can make a full contribution if your income is less than $193,000, and a partial contribution up to $203,000. You can withdraw contributions you made to your Roth IRA anytime, tax- and penalty-free. However, you may have to pay taxes and penalties if you withdraw the earnings in your Roth IRA prior to age 59½. Want more 401(k) guidance? Check out our comprehensive 401(k) handbook. It's chock-full of helpful advice and free to Morningstar.com basic members.